It is indeed a privilege for me to be present amidst you to inaugurate the Nineteenth Meeting of the Governing Council of the Centre on Integrated Rural Development for Asia and the Pacific (CIRDAP). On behalf of my country, I extend a warm welcome to all the distinguished delegates who have come from here and those who have come from abroad to this beautiful historical city of Delhi. The Centre was established in 1979 under the aegis of the Food and Agriculture Organization to assist national action, promote regional cooperation and act as a servicing institution for rural development in the Asia-Pacific region. India is one of its founder members. As a pioneering regional body with a large network, this Centre has catalyzed mutual collaboration among the member countries. In 2008, we had the privilege of hosting a Special Session of the Governing Council and Ministerial Retreat of the member nations of the Centre where ‘The New Delhi Declaration’ was adopted. 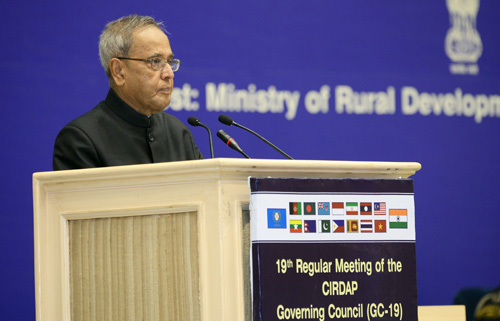 The Second Ministerial Meeting on Rural Development in the Asia-Pacific Region held in Dhaka in 2010 led to ‘The Dhaka Declaration’. These declarations have since become the guiding spirit for the Centre. They underscore the need to address rural poverty in a holistic manner by mobilizing political, economic and social resources and by channeling the flow of national resources and international development assistance. Hosting the nineteenth meeting of the Governing Council in India has given us an opportunity to reiterate this commitment. I am hopeful of this Meeting resulting in rural development and poverty alleviation issues being seen in the perspective of the current changes and challenges facing the member countries. Experience from across the globe shows that economic growth as a poverty reduction strategy has paid rich dividends. Between 1990 and 2010, nearly one billion people in the world came out of poverty. Studies indicate that two-thirds of poverty reduction is facilitated by growth while the remaining one-third is contributed by the degree of equality in the growth process. The centrality of high economic growth for developing economies therefore needs no emphasis. Despite Asia-Pacific being one of the fastest growing regions in the world, it is still beset with poverty and backwardness. Sustainable development requires us to build capacity of the rural population, particularly the poor and marginalized. Rural areas are important for any intervention in food security, education, skill development, employment, technology dissemination, health and nutrition, housing, drinking water and sanitation. For all of us in the Asia-Pacific region and for many in the world, rural development and poverty alleviation have become synonymous with national development. A rural growth strategy has become necessary to make a decisive impact on poverty and to trigger a development process that combines growth with equity. Technology has to be the vehicle to bridge distances - not only in terms of geography, but also progress and development. The digital divide between urban and rural areas has to be broken. Technology-based solutions have to assist interventions in farming, healthcare and education. Land, which is increasingly becoming a scarce resource, has to be managed efficiently. Principles of community empowerment have to be adopted to increase the productivity of land, particularly rain-fed, degraded and waste lands. Climate change, energy security and environmental degradation have to be given priority in development initiatives. Judicious resource management has to be ensured even while putting people first. Our policies have to ensure people’s participation at various stages of programme formulation and implementation; transparency in the operation of schemes, and careful monitoring. India is a proud repository of elected local self-governments - Panchayati Raj Institutions - at the district, sub-district and village levels. There is approximately quarter of a million Panchayati Raj Institutions in India. This is the single largest representative base in the world and the most prominent symbol of grassroots democracy. As one-third seats are reserved for women, more than one million out of the 2.8 million representatives in these local bodies comprise women. Most of the developmental and poverty alleviation programmes are implemented through these local bodies. Good governance practices and women empowerment measures are required to make these bodies viable instruments of rural transformation. Rural development has always been a priority agenda of our country. The last decade has marked a paradigm shift in approach towards improving the quality of life in the rural areas. Legislation and concrete programmes have sought to give focused attention on rural rejuvenation. By enacting the National Rural Employment Guarantee Act in 2005, a landmark initiative has been taken to confer legal right for 100 days of employment in a year to every rural household demanding work. The Pradhan Mantri Gram Sadak Yojana has recognized the vital importance of road connectivity, especially in rural habitations, to development. In 2011, an ambitious poverty reduction programme called the National Rural Livelihood Mission has been launched. It intends to establish self-help groups as effective institutions of the rural poor to enable them to increase household income through sustainable livelihood enhancements, increased productive capacity, generation of durable assets, assimilation of new technologies in production and marketing, skill development and improved access to financial services. Other welfare programmes have been started, aimed at providing social security net to vulnerable sections of society - the homeless, aged, widow and disabled. At a time when global economic pressures have impeded the ability of developing countries to spend in social sectors, resources from multi-lateral financial institutions for investment in rural infrastructure have become crucial. It is doubly critical that commitment of our global partners on overseas development assistance and capacity building remain firm. It is a common goal of the developing countries, more so of the Asia-Pacific region, to make rural areas a significant contributing factor to national progress. The Centre on Integrated Rural Development for Asia and the Pacific, which is active in promoting regional cooperation, has a big role to play. I would like all of you to remember what once Mahatma Gandhi, the father of this nation, had observed, I quote: "A small body of determined spirit, fired by an unquenchable faith in their mission can alter the course of History" (unquote). It is my firm belief that this Centre will help in shaping the future of the countries in the Asia-Pacific region. A positive view should be taken about the expansion of this influential regional group to new frontiers. I urge open exchange of views and experiences in this Governing Council meeting. I am most certain of the conclusions and decisions taken here to help us prepare better for the challenges of tomorrow. With these words, I declare the nineteenth Governing Council Meeting of the Centre open. I wish all the delegates a pleasant and enjoyable stay in our midst. I also wish the Centre all success.